On Friday morning, nearly 200 fans of Iceland’s World Cup soccer team — some natives of Reykjavik and other parts of the sparsely populated North Atlantic nation, others firmly seated on the Viking bandwagon — gathered in a cramped space in a midtown Manhattan pub. Dressed in their blue Iceland shirts, they were ready to cheer their country’s soccer miracle onto the next round. With a win over Nigeria, Iceland would almost assuredly advance to the knockout stage. The fans sipped on their cold Einstök ale, while chanting “ĺs-land! ĺs-land!” (Pronounced “Eees-land!). The sounds of the Viking clap bounced around the bar. But then Iceland met Ahmed Musa. The Nigerian forward, who plays for Leicester City in the English Premier League, scored a pair of exquisite second-half goals against Iceland in Russia, giving Nigeria a 2-0 win over the World Cup underdog darlings and reviving the African nation’s chances of reaching the knockout stage for the second consecutive tournament. 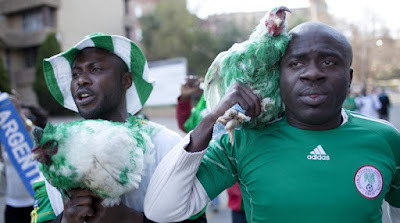 Nigeria’s victory also gave underachieving Argentina, home of the legendary Lionel Messi, a puncher’s chance of saving its own World Cup campaign. Iceland had its chances in the first half, dominating play but failing to convert its free kicks and long passes into a goal. Nigeria didn’t even take a shot on goal in the first half. In the 49th minute, however, with the score tied at 0-0, Musa took a cross, touched it onto the grass and fired it into the net off a short-hop. Then in the 75th minute, Musa outran an Iceland defender down the side of the field, moved with the ball into the middle, then dribbled around Iceland keeper Hannes Thor Halldórsson — making Halldórsson look comically slow in the process — before knocking in his second goal. A penalty shot in the 83rd minute offered Iceland a speck of hope. But Iceland’s most technically gifted player, Gylfi Sigurdsson, sailed his shot comfortably over the crossbar, knocking the air out of Iceland’s chances and out of the New York fan pub, where Iceland supporters buried their heads in their hands. Nigeria’s win gives Group D of the World Cup, already one of the tournament’s most intriguing combinations, extra drama going into the last game of the opening round. Croatia, with a 2-0 victory over Nigeria last week and a 3-0 stunner over Argentina on Thursday, has already clinched a spot in the knockout stage. Nigeria, with three points thanks to the win over Iceland, faces Argentina, which has a point due to its draw with Iceland last week, on Tuesday. If Nigeria beats Argentina, the Super Eagles advance — and knock Argentina, finalists at the 2014 World Cup in Brazil, out of the tournament. If Argentina wins and Croatia beats or draws with Iceland on Tuesday, Messi still has a chance to win his first World Cup, despite Argentina’s dysfunction in the first two games of the group stage. Iceland’s still alive, but needs a win and either Argentina to draw with Nigeria, or for Argentina to beat Nigeria, but by not too many goals. Goal differential is the first group stage tiebreaker, and at this point Iceland has given up two more goals than it has scored, while Argentina is facing a three-goal deficit. As Iceland has discovered in its World Cup debut, this tournament’s an emotional ride. Your country’s fate, for good or ill, can change in an instant. Still, after the disappointment of the Nigeria game, the Iceland pub in New York was far from somber. “We’ve still got a shot,” said Hlyur Gudjonsson, Icelandic Trade Commissioner to North America and the Consul General for New York, New Jersey, Connecticut and Rhode Island. Sure beats the alternative.